Hey there, thrill-seeker. Do you like altitude? Do you like views? Well, why not book a night in one of the tallest hotels on Earth? The tallest hotel in the U.S. opened up in Times Square this week, spurring us to take a peek at the tallest rentable rooms in the world. The 68-stories of the Courtyard and Residence Inn—both Marriott properties—at 1717 Broadway collectively stand 760 feet tall with a grand total of 639 rooms. The newly-opened building is yet another impressive, gleaming tower rising up in Midtown—that's it to the left above. The first 33 floors are dedicated to the Courtyard hotel while most of the remaining floors are for the Residence Inn. It also boasts a fitness center on the 35th floor with views of Central Park and a personal trainer on staff. You'd expect a certain amount of exceptional service at a hotel where prices start at $300 a night. That's tall, but it's still less than half the height of the nearby Burj Khalifa, a 2,717-foot-tall building. The Armani Hotel inside the Burj still hasn't opened. Image by Anjana Samant/Flickr (top) andRose Rayhaan. This hotel is not included on the Council on Tall Buildings and Urban Habitat's list of the 100 tallest hotels in the world, however, because it does not occupy 85 percent or more of the total floor space in the building. Unsurprisingly, over half of the hotels listed in the top ten are in Dubai. The location of the third tallest hotel in the world might surprise you, though. It's in Pyongyang. Yes, that Pyongyang. Although it fits the CTBUH's requirements to be included in the list of tallest hotels, the rather eye-catching Ryugyong Hotel isn't exactly finished. In fact, it's been under construction since 1987 and has made halting progress as the country's struggled economically. You also can't help but wonder what a country that can't even feed its own population is doing building such an ostentatious thing. Though, to be fair, ostentatious is kind of North Korea's thing. 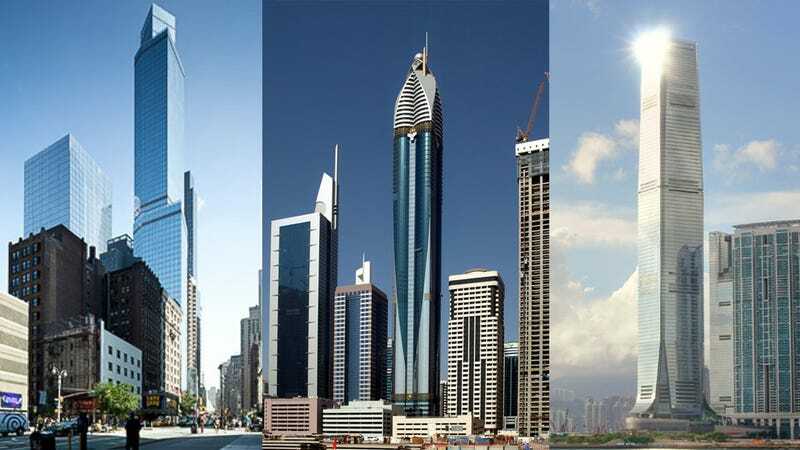 So book your room at any of these towering hotels now—but also realize that a new tallest hotel in the world is probably just a few years away. One thing's for sure, though. If you really want to sleep high in the sky, you can always book a plane ticket. Or book a room in the International Space Station, for that matter.